NAVTECDAYS - 2015 Material Available to Download. As most of us know that NAV TechDays 2015 was held last month on 19 & 20 November and with some great session and workshops. NAV TechDays is the name of a conference, organized by mibuso.com. As most of us were not there, thanks To Mr. Luc Van Dyck, who published some material from NAV TechDays on Mibuso web site. Thinking outside the box with NAV Development. Dynamics NAV Managed Service for Partners. Workshop Material of NAV TechDays 2015. Presentation of NAV TechDays 2015. There may be more material available in future, for same you can refer this Mibuso Link for all these session and Materials. 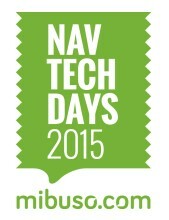 Wait, that not all, I have collected some more Info that will interest you about NAV TechDays 2015. So Let's use above link and learn what we missed. ** Product is Changing and don't leave behind.. Keep Learning.